Hey there, blog friends!! 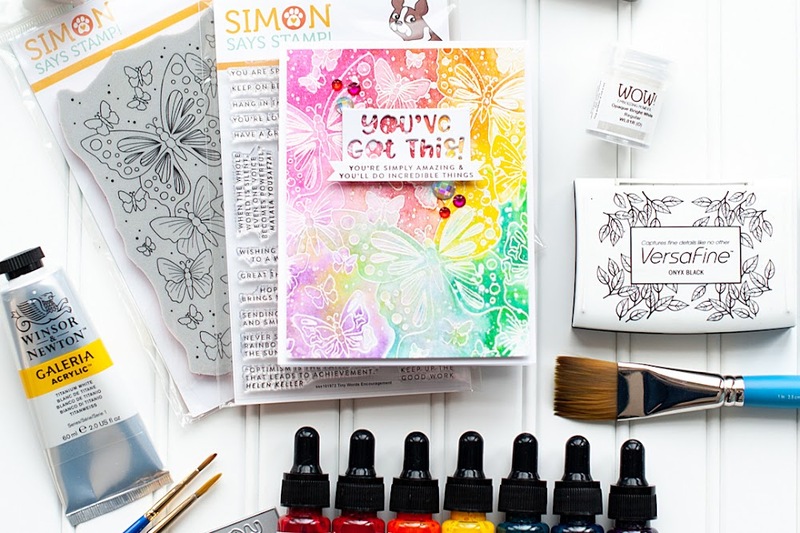 Welcome to the first day of the December Lil' Inker Designs release posts!! 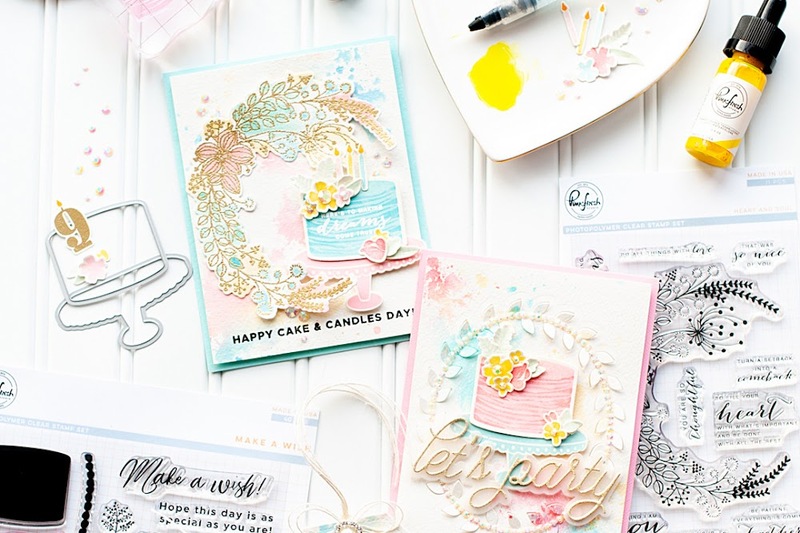 We've got 4 new stamp sets & 6 new dies, and tons of amazing projects to share with you over the next three days!! 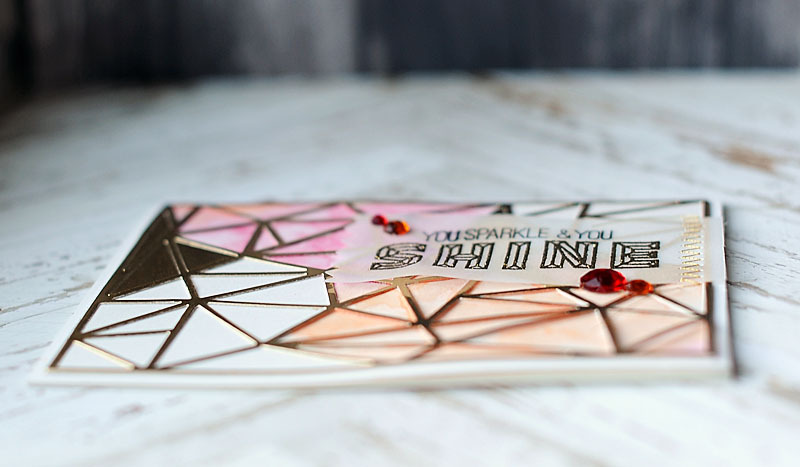 For today's post I am focusing on the following new items: Girl's Best Friend stamp set, Girl's Best Friend Diamond die, Alphabet Gems stamp set & Cover Up die: Faceted. 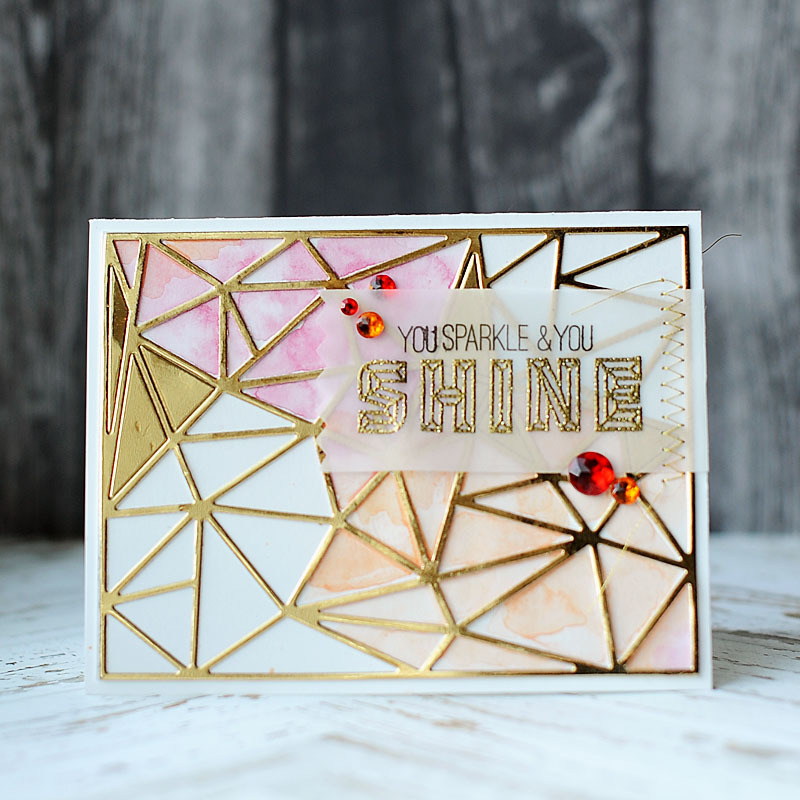 There's lots of gold & sparkles to be seen on my two cards tonight, so let's get right to it! I peeked the same products on a card of mine earlier this week. This card was created in a similar style but without the galaxy style background. For this card I started with an A2 purple card base. I blended pink & purple watercolors for the background, and then diecut the diamond from it once dry. I used a little bit of washi tape to put the diamond diecut back in its place on the background, minus the facets. This way the gold glitter paper could show through! After that I stamped the smaller gems & the star trails directly to the watercolor background. After accenting with some jewels, it was finished! 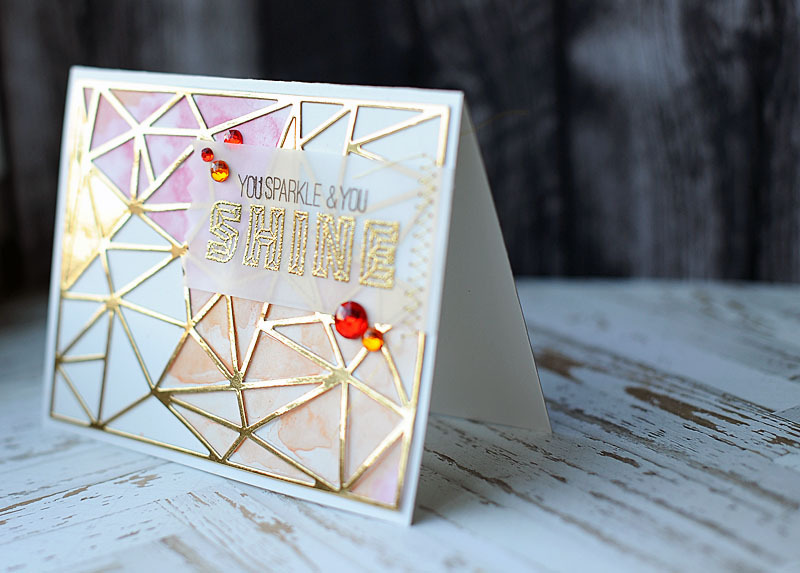 My next card uses super shine & some glittery gold, along with red & orange watercolor. The colored jewels were a perfect blingy touch! I cut an A2 card base from white cardstock to start. Then I diecut the faceted cover plate from shiny gold paper, and adhere it to the card front. I added watercolor to some of the facets very lightly at first, then added more concentrated drops of paint here & there to make it look more interesting. I stamped & heat embossed the sentiment to vellum, then stitched it to the right side of the card. All that was left was to add some jewel accents as finishing touches! wow, wow, wow...both cards are wonderful! Lea! Your cards rock!!!! Love all the details. Love your watercoloring on both cards! Awesome!!! Soooo, so pretty! Love all the sparkle and shine. I love your projects Lea! Love the watercoloring on the first and the flow of the images! Everything about the 2nd one is just gorgeous, the gold, the vellum, the colors. Beautiful work! Oh my such beauties :) love the gold with the water colored effect !! These are really pretty. I especially like the trail of stars on the first one & how it flows across & ties the whole design together. Love the water colors, these are both gorgeous! that big die is going to be used a lot. I love the watercolor look with the diamond. 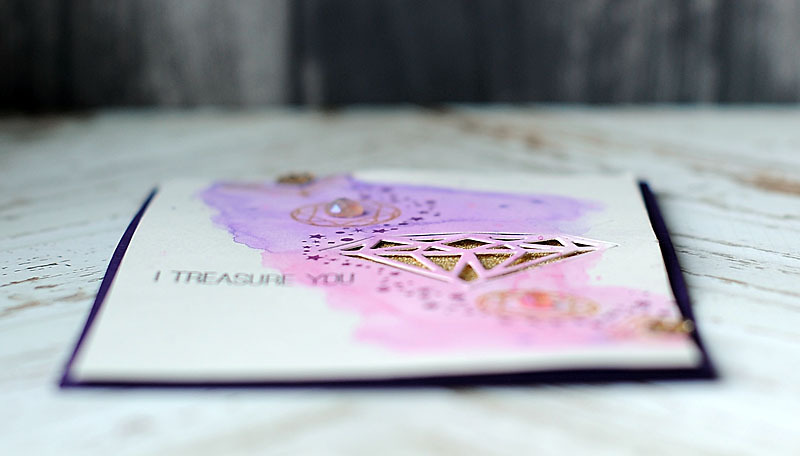 Love your cards--the purple, gold, and watercoloring are awesome!!! Fabulous cards. I love all the gold. What amazing cards. Love your ideas. Love the gold glitzy gem and that gem alphabet is awesome! 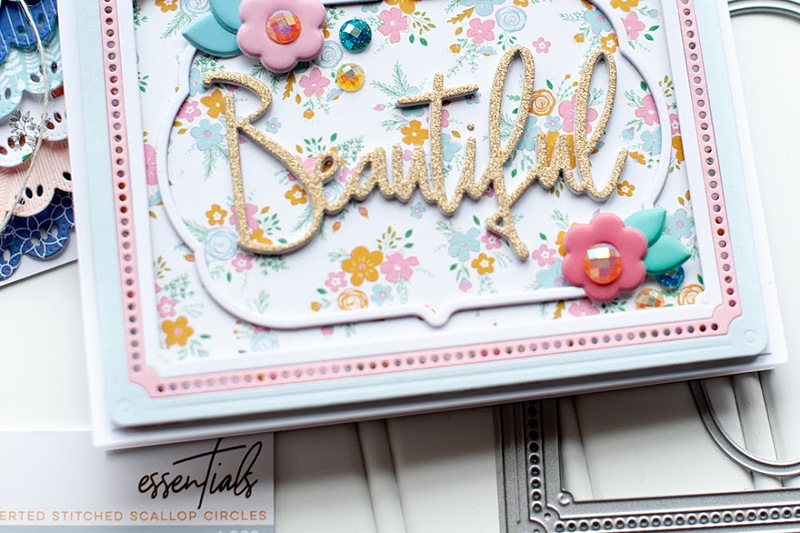 Love the metallic gold cover plate die cut, so elegant! Gorgeous cards! I'm really loving that cover plate! What pretty cards! Thanks for sharing your inspiration! Your cards are beautiful. I love the watercolor and gold. 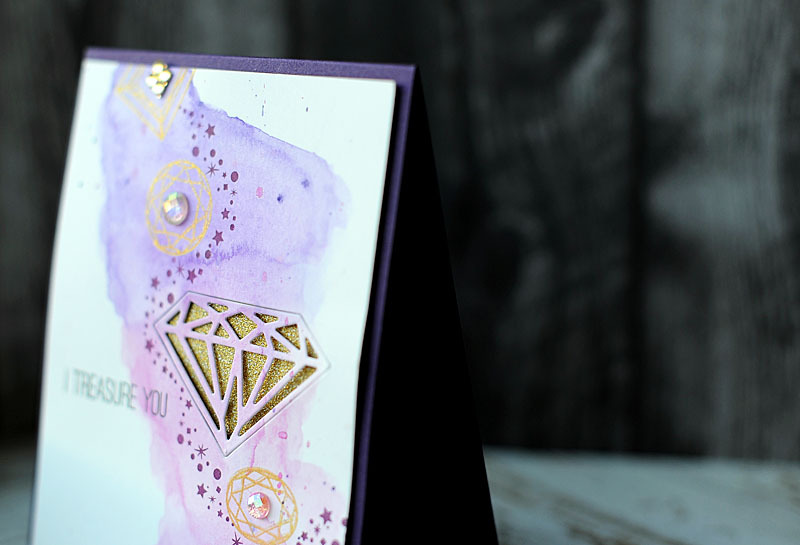 Your first card is ever so soft and beautiful, great when paired with the hard edges of the diamond! And your second has thee most perfect use of gold ever! Love the gold peeking through the first card! The use of vellum and gold embossing with sequins and watercoloring on the second card is lovely - beautiful contrast of hard and soft. These are both just stunning!!! No words! These new products look like fun to play with! Your cards are beautiful! Absolute wow factors happening here!!! The purple card - flawless!! LOVE the bling and the inlaid die! Awesome!!! The goldy card is incredible too!!! Wow!!! I seriously am convinced I need both!! !